HempCare RUBY 10% CBD Oil has several uniquw properties making it an special CBD oil. This CBD oil is distinguished by a ruby red color and a high Cannabidol content of 10%. This CBD oil contains high amounts of other cannabinoids such as CBG and CBN. 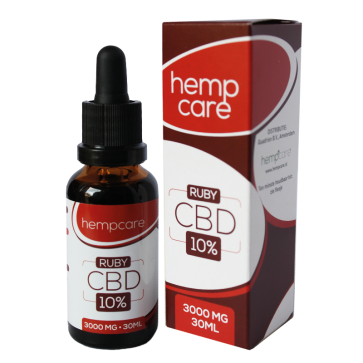 HempCare RUBY 10% CBD is also rich in terpenes wich gice the oil sa distictive taste and smell. One of the most common terpenes in the HempCare RUBY 10% CBD oil is Bisabolol. HempCare CBD RUBY 10% consists of all natural components of the hemp plant, with the exception of the psychoactive ingredient. In addition to Cannabidiol, there are more than 200 active substances, including the other cannabinoids and flavonoids, terpenes and phenols. It is a complete natural product with substances that our body recognizes and absorbs. Cannabidiol (CBD) is the main ingredient in CBD oils (CBD) and it is abundant in HempCare CBD RUBY. In addition, this variant CBD oil contains a considerable amount of CBG and CBN, respectively Cannabigerol and Cannabinol. These two are considered to be important cannabinoids in addition to CBD. CBG appears to have blood pressure lowering properties from several studies. It can also fight anxiety and depression, stimulate appetite and has antibacterial properties. CBN promotes sleep, works against cramp and is, like many other cannabinoids, anti-inflammatory. CBD RUBY (Ruby) owes its red color to the acidity of the flavonoid present. This substance, which occurs in almost all vegetables, fruit and other edible products, gives our RUBY also its characteristic flavor. The terpenes present, a typical plant substance from which many vitamins are also derived, contributes to both the taste and the smell of CBD RUBY. An example of an existing terpene in CBD RUBY is Bisabolol. This flower-like substance is known for its bacterial and fungicidal function. Hempcare recommends starting with 5 drops of CBD RUBY twice a day under the tongue. Let it work there for about 20 seconds. The effect of this is only visible and / or tangible in most people after a few days. In case of an early unwanted reaction, the recommended intake can be reduced. In all cases, the intake can also be increased. The body only absorbs what it needs, the excess secretes it in urine, perspiration or otherwise.